I attended the swearing-in ceremony at the State Capitol last week for new Governor Tony Evers, who has spent his career in education and holds bachelor and master’s degrees from UW-Madison as well as a doctorate in educational administration. As the Superintendent of the state Department of Public Instruction, Governor Evers had been a member of the UW System Board of Regents since 2009, a position he stepped down from as he became governor. From this experience, he knows a great deal about higher education in the state, and I’m optimistic that we will find many ways to work together to make UW stronger. 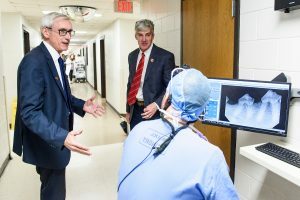 Governor Evers recently visited campus to tour the UW School of Veterinary Medicine, which is the only veterinary school in Wisconsin. Our budget request includes funding to renovate and expand the Vet School building. The current veterinary hospital is a much-used resource for farmers and pet owners – it was built to accommodate 12,000 patients a year and last year served 26,500 from across Wisconsin and beyond. I appreciate Governor Evers taking the time to get more information about the project. The veterinary school expansion is just one of many important priorities outlined in the UW System budget request, which was approved by the Board of Regents in August. The budget request also includes $82.5 million in outcomes-based funding to support university and statutorily required goals related to student success, workforce development, and operational efficiencies, and $25 million to address capacity-building initiatives, primarily for STEM and high-demand fields. Over the next few months we will continue to talk with Governor Evers and legislative leaders about this request and urge them to approve it as part of the 2019-2021 biennial budget. The budget is designed to help move Wisconsin forward by deepening support for our higher education system. • Dawn Crim, Department of Safety and Professional Services, spent two decades working within the University of Wisconsin System, first arriving on the UW-Madison campus in 1996 to work as an assistant coach with the Badger women’s basketball team. Dawn later served as the business development manager for UW-Extension’s UW-Learning Innovations program before becoming UW- Madison’s assistant director for community relations from 2004-07 and director from 2007-11. She is currently pursuing a PhD from UW-Madison in Educational Leadership and Administration. • Emilie Amundson, Department of Children and Families, received her undergraduate degree from UW-Madison in Education and is currently pursuing a Ph.D. in Literacy Studies. • Peter Barca, Department of Revenue, received a graduate degree in Public Policy and Administration. • Caleb Frostman, Department of Workforce Development, has an undergraduate degree in Real Estate and Urban Land Economics from UW-Madison’s School of Business. • Kathy Koltin Blumenfeld, Department of Financial Institutions, received her undergraduate degree in Accounting. • Craig Thompson, Department of Transportation, earned his undergraduate degree in Political Science. • Sara Meaney, Department of Tourism, holds a Bachelor of Science degree in Psychology. Congratulations to all these Badgers. We are very proud to have so many of our own in public service, showing the strength of the Wisconsin Idea.